Scary Terry's World: Flash, Bettie and.... Jaws? 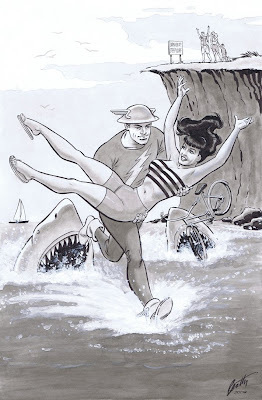 Here's a piece commissioned by a client who wanted a B&W toned image of the Golden Age Flash rescuing Bettie Page from sharks after riding her bike off a cliff! Certainly a compositional challenge, this came out looking like a vintage comic book cover -- minus the vintage color, of course. Simply sensational work, Terry. And especially appropriate, given Ms. Page's recent health setback.